Calling all fashionistas and fashionbloggers! Want to test out our updated fantasy shopping game? Email us at Info@BattleShop.co and we’ll include you in our list of beta testers. Follow BattleShop on Instagram, Twitter and Facebook for more things we love and updates on our fantasy shopping game. While BattleShop.co is getting a makeover, we’re spending a lot of time fantasy shopping looks from our favorite fashion bloggers. Although it’s snowing YET AGAIN in NYC, we’re got our eyes on our favorite Instagram fashionistas with great Spring Style. See which looks we loved this week and follow these bloggers for some fantasy shopping of your own! London-based Spanish blogger and creative director, Isabel Selles, rock a vintage-esque ensemble from Miss Selfridge. You have to check out all of the shots of this look at Un-Likely. Merrit Beck from The Style Scribe was pretty in pastels this week in her Theory jacket and Citizens of Humanity jeans. NYC fashion blogger and Child Life Specialist Kendall Johnson is ALL IN for Spring in NY, just like us! Check out the full details of this sweet chevron look at Styled Snapshots. Michaela Fisch started blogging to ease college stress, and we’re glad she did! We love how she paired her Express Midi with this Gap chambray shirt. Check out Monogrammed Midwesterner for more details. Follow BattleShop on Instagram, Twitter and Facebook for more things we love and updates on our fantasy shopping game! Be a BattleShop Beta Tester! Calling all Fashionistas! We’re rolling out a new & improved game this Spring and we need your help. Become a beta tester! We’ll be drawing 10 random names from our pool of beta testers and sending the lucky winners one of our awesome BattleShop t-shirts! Interested? Email us at info@battleshop.co and we’ll add you to the list and keep you posted on the beta test dates. While BattleShop.co is getting a makeover, we’re spending a lot of time fantasy shopping looks from our favorite fashion bloggers on Instagram. Even though we’re not experiencing “Spring-like” weather in NYC, it’s been fun seeing other fashionistas rock warmer weather style. See which looks we loved and follow these bloggers for some fantasy shopping of your own! Dallas mom/personal stylist/fashion blogger Heather Anderson showed off her edgy style in an Iro leather moto jacket and J Brand jeans. Check out more of her signature style at StyleByFluent. Olivia Rodriguez from HelloOliviaBlog is in the full Spring swing living in Miami, so we’re jealous, but we’re also big time in love with her flirty, boho Zara dress and Modern Vice lace up heels. Boston-based LA girl Kat Chang from LoveAndAce braved the New England cold for this sweet Springtime look. Her Rag and Bone fedora was the perfect topper for this look, don’t you think? Spanish fashion blogger Beatriz Jimenez from NecklaceofPearls dressed up her boyfriend jeans and graphic tee with a Fendi jacket and Louboutins. And she’s totally pulling it off. Enter For a Shot to Win a BattleShop Tee! Enter our ROSTER CONTEST and you might win one of these awesome BattleShop T-Shirts! Available in Women’s and Men’s sizes and styles. Send us a roster idea and 6 items to fantasy shop for. If we select your Roster, you’ll get one of these! Email us your submissions to info@battleShop.co. Contest ends May 1, 2015. Good luck! We’ve received some great submissions in our Roster Contest, but we still want to hear from you! Send us your idea + 6 items for the roster (a great name gives you bonus points! ), and if we decide to use your roster, we’ll send you an awesome BattleShop t-Shirt! Send your ideas to info@battleshop.co. Good luck! 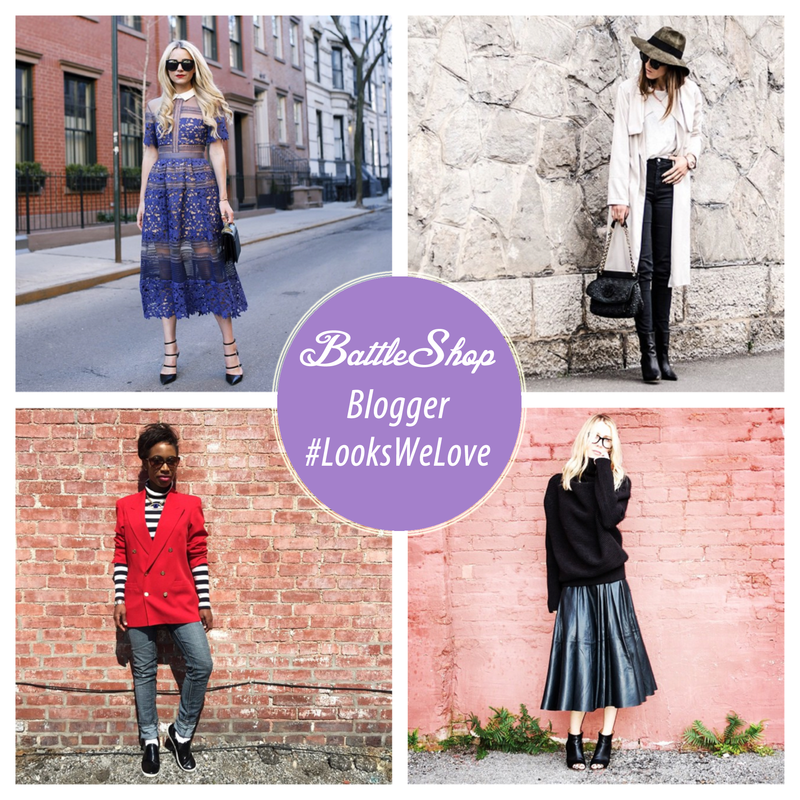 While BattleShop.co is getting a makeover, we’re spending a lot of time fantasy shopping looks from our favorite fashion bloggers on Instagram. Everyone seems to be so hopeful for Spring and we’re loving transitional looks, as well as full-on fancy frocks. See which looks we loved and follow these bloggers for some fantasy shopping of your own. Blair Eadie was beautiful in blue in this Self Portrait dress on Thursday. See more of her East coast-West coast style at Atlantic-Pacific. Alison from BangBangBlond paired a timeless H&M trench coat and Zara hat for what she calls a “British Chic” look. We love it! This Style Director/fashion blogger is ringing in Spring with bright colors. We love Khola’s vintage red blazer and J.Crew striped shirt. Check out more of her style at Khola’s Kloset. Ashley from Six Feet With Heels is showing off her stylist skills in this gorgeous Vera Wang pleated leather midi skirt. Obsessed.